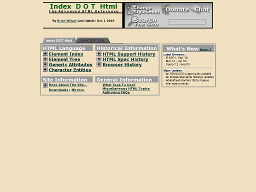 Index DOT Html An advanced HTML reference guide and covers all HTML tags and attributes providing definitions, usage and examples. Very handy site. 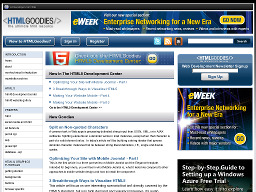 Web Developer's Virtual Library An Internet.com site that has a vast amount of information for webmasters and web developers. Find detailed information on authoring, dhtml, graphics, HTML, multimedia, programming, software, WDVL and more. 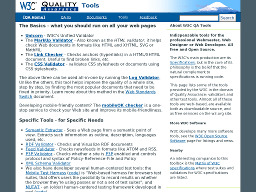 Quality Assurance ToolBox Quality Assurance ToolBox at the W3C Consortium offers a suite of validators that you can freely use. Includes a markup validator, css validator, xml validator, a log validator and more. 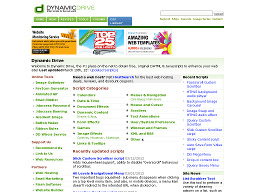 Dynamic Drive An excellent source to obtain free, original DHTML scripts and components to enhance your web site. Over 12 categories of scripts to choose from, plus online wizards, FAQ's and pointers to other great webmaster resource sites. Draac.com Draac.com bills itself as a complete guide to html. 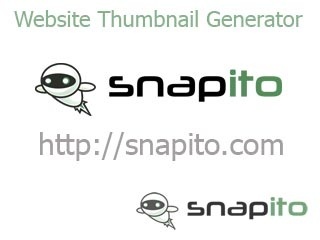 The site has a simple, appealing interface with a lot of good tutorial info as well as links to great online tools. 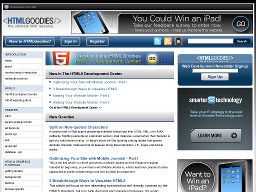 ActiveJump.com A HTML tutorial site. If you're looking for a solid information on the basics of HTML, this is a good place to start. 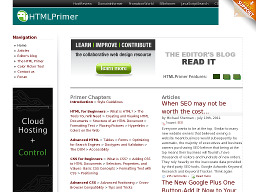 Covers all the major HTML areas and provides helpful examples of usage. 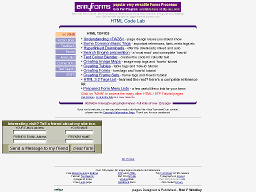 HTML Code Lab Primarily an HTML tutorial site but, if you take a closer look, it also offers free buttons, backgrounds, cgi scripts and more. This site is packed with 120 pages of useful information. 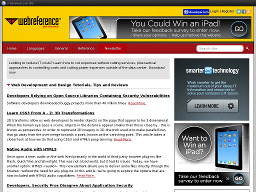 WebReference.com Another great webmaster resource site all about the Web and Webmastery. From browsing to authoring, HTML to advanced site design, this site has it all. The Web Design Group Offers material on a wide range of HTML related topics. 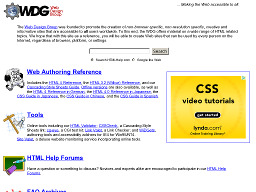 WDG is basically a reference site that covers the basics of HTML. 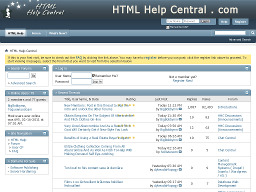 It also offers online tools, web authoring FAQ archives, an HTML Help BBS and more.